Review Summary: BAL GANESH is an interesting celluloid experience that should attract kids by the dozens. 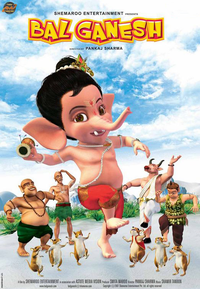 BAL GANESH is an interesting celluloid experience that should attract kids by the dozens. Exactly two years ago, on October 21, 2005 to be precise, Hanuman opened the doors for animation films in India. Very strongly recommended for kids. Elders who need something different in terms of technology and content are advised to accompany the kids. Worth watching. Overall, Bal Ganesh is a good effort, and worth a watch.